In this generation, you can be honest towards others or you cannot be. But the most important part to be honest towards yourself. If you lie to others or even you cheat them, they will not know about it. However, you will know each and everything, so you cannot hide anything to yourself. Instead at some point of time, you will feel guilty and ashamed for what you did. Also it will keep reminding you that you did something unusual and bad which you should not have done. After reaching a limit, you start hating yourself for the things which you have done in wrong way. It should not happen as it will decrease your self-esteem and lead to many mental problems. Therefore, the primary aim of every person should be that without hesitating about anything, you should start speaking to yourself and try to be honest with yourself by making things quiet comfortable. Do not feel shy to speak to yourself. It will make you quiet clear that you are well aware of what you did and how you should pick up yourself to avoid making mistakes. 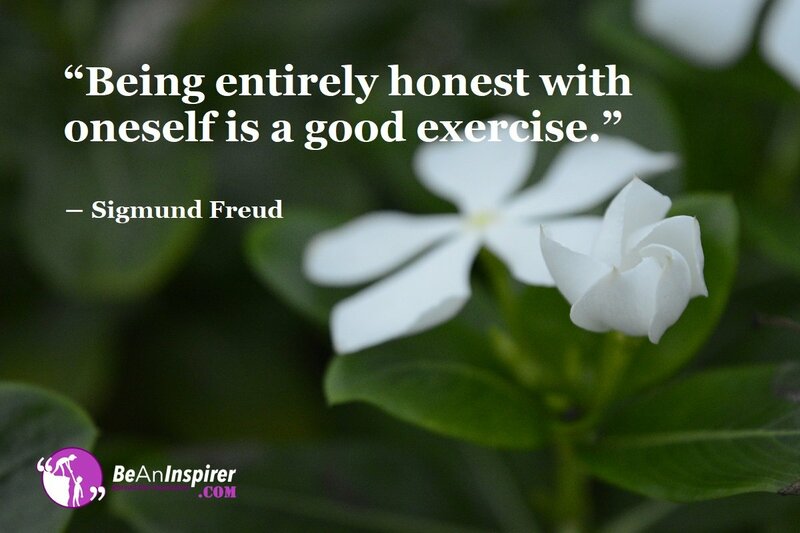 Be honest towards yourself, it builds your confidence. In life, you can cheat others by fooling them but when it comes to cheating yourself, it is quite impossible. You cannot hide anything from yourself, as your inner person will remind you of all your mistakes. Consider two children ‘A’ and ‘B’. The first child ‘A’ is fond of toys and his parents buy him a cool watch. Then he comes to his friend that is child ‘B’ and shows him that watch. The child ‘B’ is poor financially and his parents cannot spend their money on a single watch, so the child ‘B’ becomes greedy and steal the child A’s watch. Child ‘B’ will be happy that he has the watch and enjoying the present moment. However, inner side he will be guilty that he stole his friend’s watch and he did a wrong thing. After realizing that he cannot hide anything from himself, he returned the watch back to his friend. So the most important part is that it is good, to be honest with yourself as it will keep you growing without making you feel guilty. Therefore, in the end, you should be honest with yourself at any point of time, which will teach you how to lead a life with discipline, and the most important part is to stay positive with yourself. Make sure that you do not hurt others as well as yourself as cheating does not last long. One or the other days, you will have to face the truth in your life without hesitating about anything except your mistakes in advance, which makes you be honest. Honesty unveils the real you from inside. You must have faced various situations in your life where you have to choose between honesty and dishonesty. Let us know your views about this article and how you imbibe honesty in yourself. Keep Commenting!